The first in a series of hardbound copies of Grace Brethren news as it first appeared on this blog is now available from BMH Books, Winona Lake, Ind. 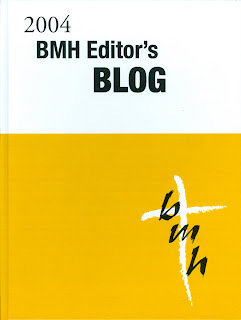 Plans call for a print version of each year of the blog, which was begun in May 2004 by Terry White, executive director of the Brethren Missionary Herald Company. The 119-page book was created for historical and archival purposes and includes an index of entries. Printed as an on-demand publication, it is available from BMH Books for $50, a fee which covers manufacturing and shipping. To order the book, click here. Please allow 10 to 15 days for delivery.